Creating the best digital marketing strategy for any business is based on the collaborations made on the different channels available. Speaking of digital marketing channels, Organic and Paid channels are the most popular. These two alone constitute to an average of 70% of all digital marketing related revenue. Based on a study, Organic search attributes to 95% while 5% is given to Paid search for all search engine related clicks. This is a huge statistic to consider but while Search Engines is a huge source of related traffic. Affiliate websites where paid listings are being placed as well also presents a huge targeted source of traffic. This is one of the many unique features that Paid listings brings that is not available for Organic Search. To know more about these marketing channels, the next topics below will run through important concepts on paid vs organic. In digital marketing, Organic Search is defined as anything that involves unpaid, natural, and search results driven traffic mostly coming from good SEO practices. Organic Search is often attributed with the concepts involving SEO efforts. But with the current advancement in Search Algorithms, Organic search is also affected by efforts in Social Media, content marketing, and even Paid Search. White-Hat Techniques are often associated with a long lasting organic search ranking. The better the implementation of the said techniques the higher the ranking. When it comes to choosing the best strategy to implement, one must consider the state of the website in terms of “Search Engine Friendliness”. This can be done through an SEO Audit. This is the process of evaluating a website through a set of test to determine its state in terms of SEO. Another thing to understand when it comes to Organic Search is to understand the concept of Search Algorithms. A Search Engine Algorithm is a mathematical formula — set of computational rules — that search engines use to rank web pages in response to a search query. The formula is computed through more than 200 search factors that affect the rankings of websites. These search factors are what Organic Search is being optimized in any website. The most important website elements to optimized are Content, Link Profile, and Website User Experience. If you want to improve organic search for your website, begin by creating an analysis of your website through an SEO audit. Paid search ads – These are the search listings available on Search Engines and their affiliates. The formula search engine follows are these: Better website content constitute to low bids on higher positions on paid search. Paid search advertising – Is the process of acquiring the paid search results needed by a website. It involves market analysis, keyword research, bid placement and managements, and Conversion rate optimizations. If you want to pursue SEM for your website, read about what Google and Bing can provide in terms of this type of advertising. Google alone attributes to more than 90% of revenue coming from digital advertisements. This is a testament of how effective and efficient it is to acquire paid listings in Google. Now that you know more about Paid and Organic search and how they work. It is time to weigh in on your choice of the best digital marketing channel to improve on. Businesses often have different needs and budgets for their marketing. The next topics below will deal with the pros and cons for both channels. Understanding this concept will help you decide on what to pursue in terms of the marketing channel to use for your business. Organic search is a known source of “free website traffic”. This means that there is no monetary influence given to the search listing rank that a website might have. Much of the cost associated with organic search is attributed to hiring an in-house SEO or choosing to get the services of an SEO Agency. Organic search is all about ranking for the best position in Search Engines like Google and Bing. In addition to being a free source of website traffic, here are some specific benefits of choosing to optimize for Organic Search. Click through rates: If you rank in the top 3 of the search results, you can always expect better CTR. In addition, the improvement in Search Results (Featured Snippets Aka Schema Markup) creates better CTR results in the same rankings. Website optimization for organic search, there are also set backs to this marketing channel. SEO requires multiple research, effort, and time. The resources and man-hours put into this is dependent on the competitive state of your business space. In addition, selection and management of personnel to do your SEO can also be a draw back in the long run. Getting the right person to do your SEO can sometimes be focus on the industry that you are in. No SEO specialist is an expert in all type of industry. Do enough research when choosing the best SEO personnel for your business. Time: The higher the competition in your marketing space the more difficult it is to rank for the keywords of your choice. Efforts to outrank your competitors will take more time as compared to lower competitions. The best way to go about this setback is to target multiple competition level in your business space. Keyword research will help identify the opportunities. Resources: As time being a resource, man hours and marketing resources (Content, Images, Videos, etc) will also be in much need to outrank your competitors. Investing is a must and should be given much attention. Careful planning on your strategies will improve efficiency in the use of your resources. Maintenance: As your competitors become more adept in your business space, rankings tend to be difficult to maintain. Constant update on the landing pages that are ranking is essential. The best practice is to update and improve content once every year. Click through rates: Searches using terms that denote high purchase intent such as product or brand-specific keywords will get more clicks than organic results. The advantage of paid search can clearly be seen in the Internet retailers MarketLive Performance Index data. For the year 2013, PPC accounted for 36.5% of search traffic but an outsized 47.9% of revenue from search. Click through rate: Except for high purchase intent searches, users will click on paid search listings at a lower rate than organic search listings. Organic listings have more credibility with search engine users. With the recent updates in Paid listings, we saw a gradual increase in Clicks for Paid ads. Google to be specific has updated their paid listings on the search results to mimic much of the design and behavior of Organic search results. If you are to choose between Paid vs. Organic search, then the best advice would be to use the both marketing channel. Businesses would want to have presence in both marketing channels as they will ultimately lead to more revenues. SEO provides a longer and sustainable search engine ranking while Paid listings provide immediate results for a price. In addition, time is an issue in SEO and this is not the case for Paid ads. Incorporating the pros and cons for both marketing channel leads will lead to better results. It is also worthy to consider that SEO and Paid search complement each other. Ranking factors for Organic search also affects Paid Search Rankings. 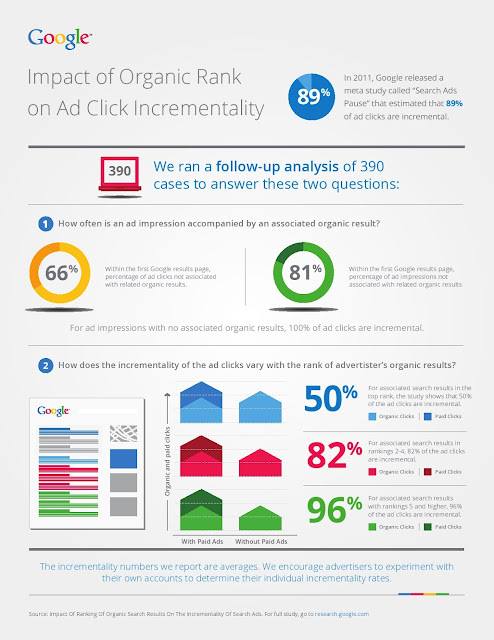 A Google Study below sites relevant statistics about paid and organic search. This will help you decide on why Paid and Organic will go well together. Based on this Google study, paid search ads with an organic search result for one website only appears 19% on an average. In addition, only 9% of the time a paid search ad shows with an organic ad as the top rank. One important behavior is that when both paid ads and organic search appears on the SERPs registers higher Click Through Rate than only having one of each. This search engine behavior also help organic search ranking on the top position. It will highlight how credible the website is to the user. Another important concept to consider is that Google Search results showed that 50% of ad clicks did not replace the clicks on the first organic search listing when the ads didn’t appear. The study also found out that 82% of ad clicks are increasing when they are associated with organic result is ranked between 2 and 4, and 96% of clicks are incremental when the brand’s organic result was 5 or below. This study shows the benefit of having a well-executed plan to optimize both Organic and Paid search listings. You will be hitting two birds with one stone is what you will achieve when optimizing both for Organic and Paid search. Most of the website quality improvement required for paid search can be integrated in your SEO Plan. Finally, if you are looking to acquire the services needed for Paid vs. Organic Search then let eComtuning.com help you with these. We provide the one of the best Search Engine Optimization services plus our Paid Search optimizations are also at par with the best in the business. Let us know of your business goals and we will give you the best path to reach them. We also offer a free and Complete SEO Audit for your website. Give us a call today.